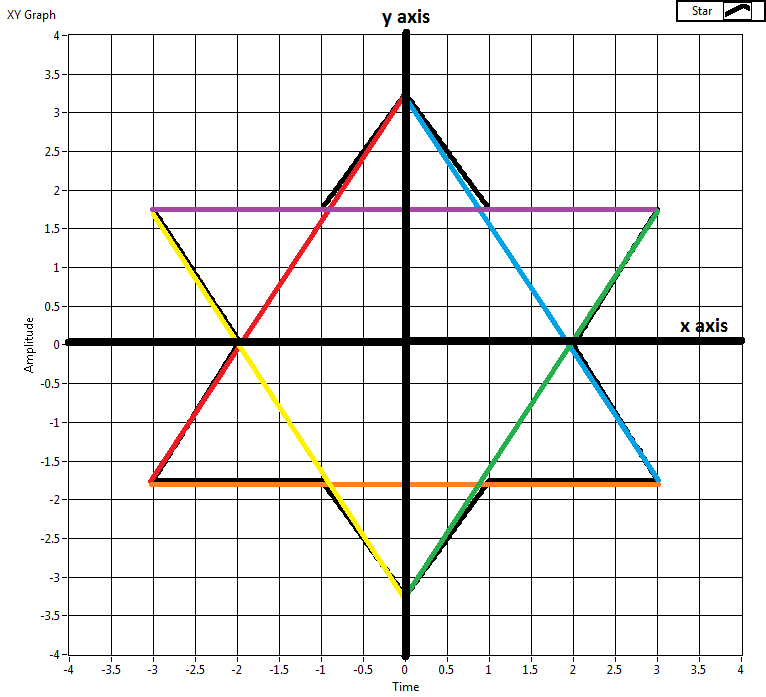 The star implemented consists of 12 sections that are drawn in the same order as in the picture above. There are always two sections with the same equation as they make up one side of a triangle. The variable index is the loop iteration counter that goes from zero to N-1 whereas N is the number of points the star consists of. This code was put into a formula node with only two inputs: the total number of points N the star consists of and the iteration counter index. The code has then been collapsed into a subVI with only one input, the number of points for the star. The subVI has two outputs, one array for the X axis and one array for the Y axis where each pair of numbers make up a point on the sketch. The numbers range from -3.25V … 3.25V for both the X and the Y values. In this figure, the output arrays for both the X and the Y values will hold 1200 values each.